In the aftermath of traumatic and victimizing events, most individuals (some 70%) evidence resilience, while up to 30% evidence chronic PTSD and related adjustment problems. 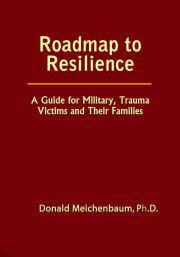 In Roadmap to Resilience, Dr. Meichenbaum discusses the differences between these two groups for both military and civilian populations and specific ways to bolster resilience in six domains (physical, interpersonal, emotional, cognitive, behavioral and spiritual). It includes numerous examples of successful coping strategies, self improvement Action Plans, Hinge questions that open the door to possibilities, and a comprehensive Resource Guide designed to help the reader locate the exact information they need to address their situation and to help them become more resilient. User-friendly Appendices provide an easy-to-use guide on how to retrieve How To information for any specific need or interest area. This Guidebook will be of great assistance to help individuals and their families reintegrate and cope with the lingering effects of trauma. Clinicians will find it an invaluable resource of translating evidence-based interventions into specific guidelines for their clients.